Next Science Pub, April 14 2pm @Brocach on Main Street! Dr. Steinberger received his MSSW in 1983, his PhD in 1986, and has been a licensed psychologist in private practice in Madison, Wisconsin since 1987. He completed a post-doctoral fellowship at the Albert Ellis Institute for Rational Emotive Behavior Therapy in 1991and he holds the Certificate of Proficiency in the Treatment of Alcohol and Other Psychoactive Substance Use Disorders from the College of Professional Psychology of the American Psychological Association. Exciting news. 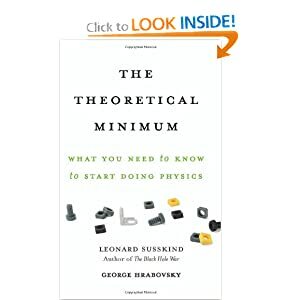 George Hrabovsky, co-author of The Theoretical Minimum will be our March Science Pub Speaker! He’ll talk about his book that introduces the very real idea of DIY physics. He’s demystified the process for himself and now shares with readers the same accessible material. This is really NOT to be missed. George Hrabovsky is founder and president of an organization called Mad Science Tech and has a lot of incredible passions including mathematics, physics, meteorology, storm chasing and more. Please join us! It’s free. It’s fun and informative. We’ll also see about having copies of his book on hand for signing. Professor Bonazza’s interests are in the areas of instrumentation and associated diagnostics as needed in the experimental investigation of impulsive, unsteady fluid flows such as shock-interface interactions and vapor explosion phenomena.The interaction of a shock wave with the interface between two fluids of different densities enhances the mixing that takes place at the interface. In some cases the mixing is detrimental to the objectives pursued in the application. In inertial-confinement nuclear fusion experiments, eg, a spherical, hollow shell containing a deuterium-tritium mixture is imploded by the shock wave generated by ten laser beams focused on it. The objective is to raise the temperature and density of the nuclear fuel to obtain a self-sustained fusion process. Upon acceleration, the shell’s manufacturing imperfections amplify causing the ablated shell material to mix with the fuel thus causing the end of the fusion process. In supersonic combustion systems, where fast, thorough mixing between fuel and oxidizer is indispensable to effective burning because of the very short residence time of the oxidizer in the chamber, shock-enhanced mixing could be used advantageously. The interaction of a shock with a fluid interface is investigated experimentally in a vertical, square shock-tube, using non-intrusive, optical diagnostics techniques.The study of vapor explosions is related to the development of an industrial waste-processing technique in which a water solution of toxic organic compounds is injected into a pool of molten iron, to use the thermal shock and the catalytic action of the iron to chemically crack down the toxic compounds into their harmless components. The mechanisms of explosive vaporization, and the thermophysical conditions under which a mechanical explosion takes place are investigated. In a cryogenic simulation experiment, the interaction of hot water with different types of refrigerant is investigated, using a light-extinction technique. In another experiment, water is injected into a pool of molten tin and the system is imaged with a continuous X-ray source and digital imaging system. Science Pub is calories for your brain. The beer is for your belly. Science Pub will be held this Sunday, January 13, 2013 from 2-4ish at Brocach Irish Pub on Main Street on the Capitol Square in Madison. As I type this, it’s dawning on me that we are doing this on the 13th day in the 13th year…perhaps I should have found someone to discuss numerology? No matter, no one can compare to this talented, smart woman – Natalie Hagen – who is a physical therapist who recently received her PhD and will be presenting on stem cell transplants and recovery from a PT’s perspective. This is a different and exciting topic. If you can come, I’d love for you to shoot me an email to gauge how many people are coming. Thanks! and many more. Yes, I’ll update this page eventually!